Patagonia Technical Sun Gloves offer the superior hand protection for anglers fishing in all sunny climates from tropical flats to the Texas Gulf. The Caddis Fly ships your order PROMPTLY with NO SALES TAX. There are many very good warm weather fly fishing gloves available these days, but none will surpass the performance of this Patagonia glove. 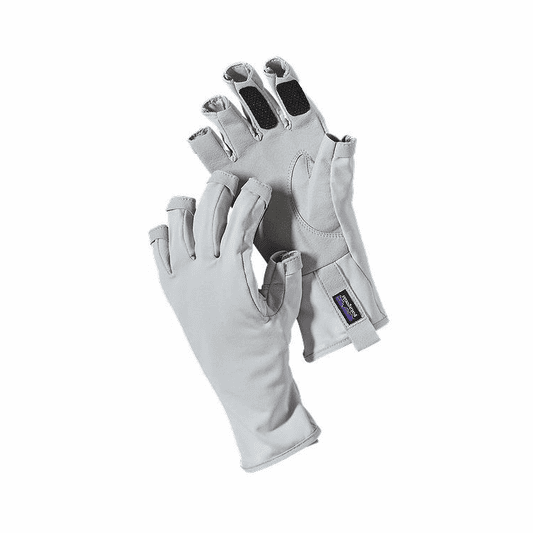 Patagonia Technical Sun gloves protect from sun on backs of your hands, and prevents line cuts on stripping fingers too. Easy grip palm and fingers make rod and line handling easier, without adding extra stiffness. Why purchase your Patagonia Technical Sun gloves from the Caddis Fly Shop? We can provide your gloves plus flies, leaders, rods reels and technical support that is first cabin; it is that simple.